No one said this playoff thing would be easy. The West Linn boys basketball team knows that as well as anybody. The seventh-ranked Lions got an example of that in the first round of the Class 6A state playoffs on Feb. 28 when they had to struggle past No. 26 Madison 63-58 at West Linn High School. "We faced a lot of adversity through the season," said senior Ahmir McGee. "It happens, there's going to be bumps in the road, it's just how you respond to it." 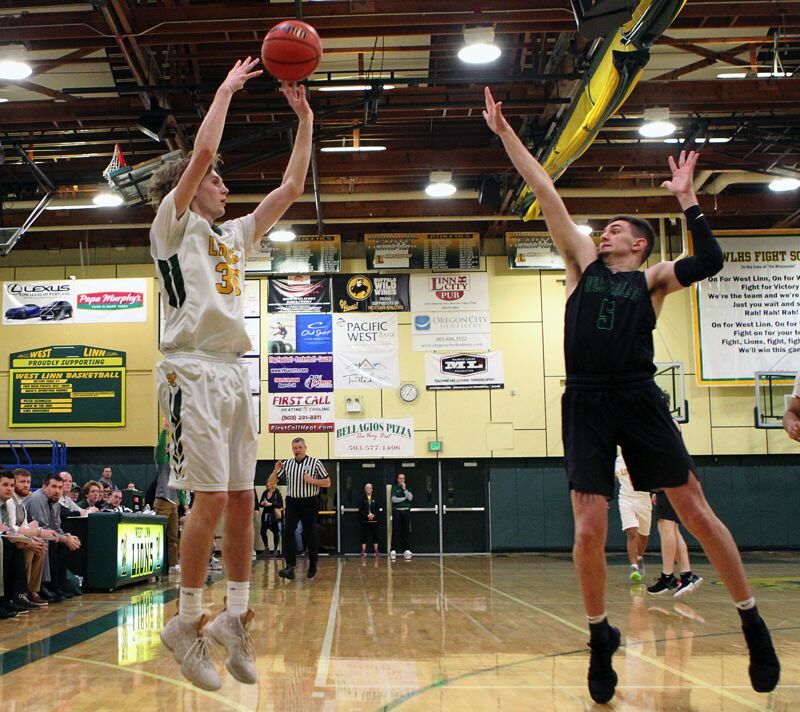 With the win, West Linn — the second-place finisher in the Three Rivers League — improved to 17-8 and advanced to the second round of the playoffs. See the accompanying story for more on the Lions' 72-62 Saturday loss to West Salem. Madison, meanwhile, ended its year at 15-10 after finishing in a sixth-place tie in the Portland Interscholastic League. As to the adversity McGee mentioned, Madison did its best to share some of that right away, speeding out to a 22-18 first-quarter lead behind eight points from senior wing Mujeeb Rufai and another five (including a 3-pointer) by senior Michael Bennett. West Linn senior Jalen Thompson did his best to keep the Lions close, knocking down two "threes" in the period while junior Damiko Tidmore scored twice in the period. Both teams' offenses slowed in the second period, but the Senators managed to extend their edge to 34-25 at halftime, with Rufai adding another five points and senior teammate Jordan Hill hitting a 3-pointer. On West Linn's end of the court, the Lions managed just seven points in the period, their efforts led by sophomore Bryson Crockett's three. With their season hanging in the balance, however, the Lions awoke in the third quarter. West Linn turned up its defense, sped up its attack and raced to a 23-11 scoring edge in the period, that effort giving the team a 48-45 lead heading into the fourth. Thompson led the way again with two more "threes," sophomore guard Micah Garrett added six points on three baskets, and junior Drayton Caoile and Tidmore had four points apiece as the Lions moved in front. Bennett had five points (including a 3-pointer) in the period for Madison. While Bennett scored seven points and junior wing Tre Ratcliff added six in the final period for the Senators, the Lions managed to seal their victory in the final eight minutes. Thompson added his fifth "three" of the game and scored five points down the stretch, Crockett tacked on four more, and Garrett and Caoile another three each in the win. "We have a lot of young guys," explained Garrett. "We're young — we only have two seniors and so we're still getting used to playing on the varsity level." For the game, Thompson led the Lions with 17 points, Garrett added 13, Crockett had 12 and Caoile nine. Bennett led all scorers with 19 points, Rufai had 15 and Ratcliff 14 in the loss.